Ace spinner Harbhajan Singh feels India have a great chance of winning the second Test against South Africa provided they bat well in the first session and post a target of over 300 on Tuesday, Day 3. On day 2, that saw 18 wickets fall, India finished on top, with an overall lead of 166 runs and six wickets in hand in their second innings. Harbhajan said the onus is on VVS Laxman and Cheteshwar Pujara to help India set a target of over 300. "Tomorrow is a big day. It is the day for us to level the series. Just need to have faith in our abilities, back ourselves to score on this wicket," Harbhajan said at the post-match press conference. "There's still lot of cricket left. We don't want to be complacent. We want to bat well tomorrow. Hope Laxman and Pujara can bat a long time and get a lot of runs on the board, and then we'll take it from there. "We need to make sure we score more than 300. If we do score more than 300, we definitely have a very good chance. If we bat well tomorrow we can definitely score a lot of runs. If you survive the first session we have a great chance to win the Test match," he added. Harbhajan (4/10) and Zaheer Khan (3/36) wrecked havoc to dismiss South Africa for 131 on Monday and help India take a 74-run first innings lead. The offie said the bowlers were rewarded for bowling in good areas. "Obviously, when you get wickets you can't complain. It was nice to be out there taking wickets. All the bowlers bowled really well. We got the reward for bowling in good areas," he said. "There is extra bounce but you still need to be very sure of length. Slightly short can go for runs. Slightly fuller also can go for runs. "I'm talking from a spinner's point of view. Fast bowlers obviously need to make batsmen come forward. They are big time in the game then. But spinners, you can go for runs. Sides are also small. With bounce you can connect well," he added. Harbhajan also made special mention of Zaheer and termed his three-wicket haul as outstanding. "In the last press conference I mentioned other people can definitely do the job and I will stick to those words. But, obviously, Zaheer is an experienced guy and whenever he plays he plays a major role in the bowling department; and, obviously, it's great to see how he approaches each game and takes crucial wickets," Harbhajan said. "He's been outstanding. Not just taking wickets, he helps other bowlers also to take wickets. He is the man. You were right. I was wrong," he added. The 30-year-old offie also praised Rahul Dravid for taking his 200th catch in Test cricket today. 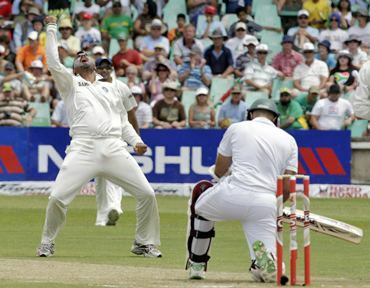 "Dravid took a brilliant catch. That was me and him, the 50th catch of my bowling as well. It was great. It would have been nice to see him still batting, but, unfortunately, he's not there. 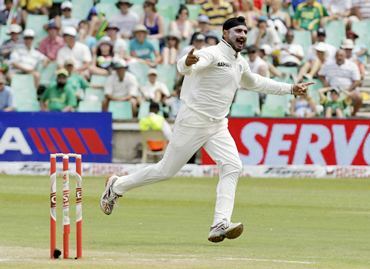 Asked about the Kingsmead track, Harbhajan said, "There's nothing wrong with the wicket. We need to play better cricket. It's still a good wicket. It will become easier tomorrow because there will be sun out. If you bowl in right areas there is a little bit extra bounce but not lateral movement. You can pick wickets. "But the way Hashim was going, the batting was looking simple. Whenever someone is in you need to make full use. I don't know how 18 wickets happened," he added. Asked if he enjoys batting as much as he savours his bowling, Harbhajan said for him playing cricket has always been the most satisfying thing for him. "Both. I enjoy playing cricket so whenever I do something special I always enjoy whether 100 or five wickets or four wickets or brilliant catch. It's satisfying. Playing cricket, very satisfied." 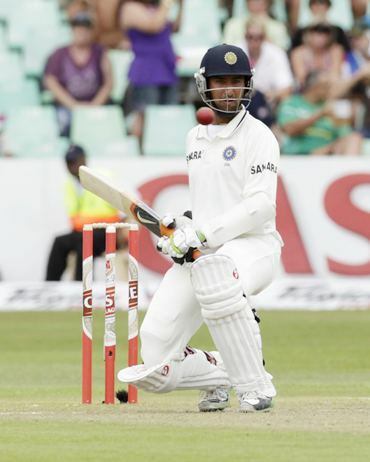 Harbhajan also heaped praise on debutant Cheteshwar Pujara, who was unbeaten on 10 at stumps. "He showed great character to be there. He showed he wants to be the player to be counted for this game. He practiced very hard, he's gutsy player, I hope he'll start converting his domestic 100s to international games also. "Whenever I've seen him bat in the nets he works very hard. He's not worried about the bounce or the pace or anything," he added.